Cargobikes have been on an incredible ride of popularity recently, with new designs and ideas coming out on the market nearly every month. Along side of this, the family cargobike is now becoming something like “car replacement therapy” for a growing number of households throughout the nation. While this all seems so new, there is a storied history of the cargobike that folks are just beginning to get to know. Curiously, most New Englanders are largely unfamiliar with cargobikes. However, if you have traveled to Holland, Denmark, China or any number of countries where bicycles are used for daily transportation, you many have perhaps noticed children and all manner of cargo being carried on bikes of a variety of shapes and sizes. It’s likely you spotted a cargobike. The term “cargobike” can be a little confusing. Cargobikes are sometimes called a cargo bike (we like to combine it into a single word "cargobike"), a utility bike, a transport bike, a bakfiets (Dutch for “box bike”) or a myriad of other nomenclature. 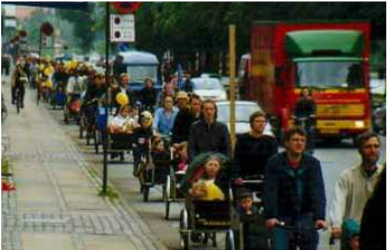 25% of Copenhagen’s residents with 2 kids or more own a cargobike. Click on the picture to see a great video about the city's cargobike culture. Typically, cargobikes have two to four wheels and are either exclusively human-powered or a hybrid of human-power and electric-assist. They also have an area set aside for hauling things like groceries, kids, adults, refrigerators or whatever else. They come in all shapes and sizes, and each design comes with its own set of advantages and characteristics. The thriving cargobike movement in the U.S. is bringing with it a whole new level of utility and carrying capacity to bicycle transportation. You might not know it yet by living in New England, but go visit places like Portland, OR, Chicago, or Vancouver, B.C., and you’ll witness what’s happening. And actually there is now a real nice community of cargobike families taking root in Boston. The bicycle is being redefined, rethought, reinterpreted, and re-engineered. The first effective cargobikes appeared during the bicycle craze of the 1890’s, a time when there were more than 300 bike manufacturers in the U.S. alone. In Europe, where cargobikes were invented, they were designed for almost every job imaginable – for firefighters, carpenters, dairies, bakeries and an endless array of other applications. It was a time of unparalleled development for human-powered vehicles and the cargobike was showing up all over the world. 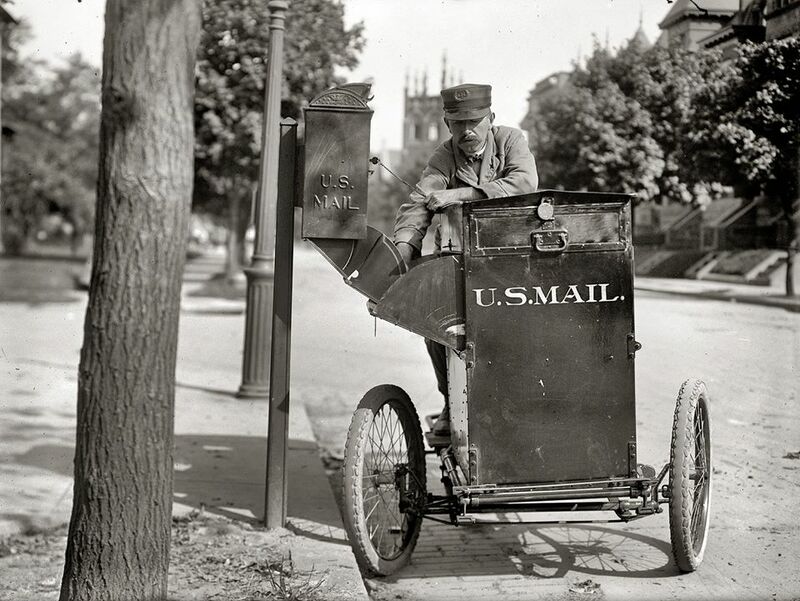 Some earlier designs, like the British Postal Service you see to the left, were plagued with interesting problems. In this case, the center drive wheel on these five-wheeled cargobikes, or "pentacargocycles", didn't contact the ground so firmly when riding over the uneven streets of London. There was probably plenty of lost time getting on and off to push the bike ahead and probably a bit of grumbling, too. Marcel Cognasson won the 1926 Championnat des Triporteurs. 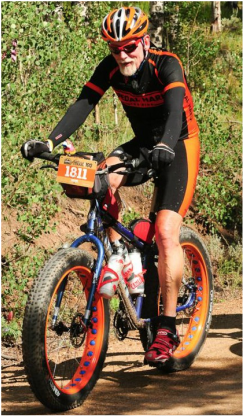 On a 143 lbs trike he rode a 31 mile course in strong headwinds in 1 hr 48 min - average speed 18 mph! However, as the years went on the designs were perfected and the cargobike became the go-to vehicle for local transportation. In Paris, cargobikes serviced train stations, hotels, and markets all over the city. 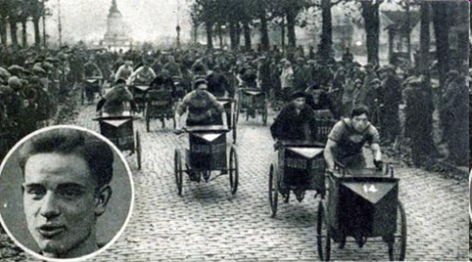 Parisian cargobike races drew thousands of spectators and the winners were often celebrated as heroes. Many of the riders were not only hard working deliverymen, but also fabulous athletes who accomplished feats of cycling on loaded cargobikes that would seem almost superhuman today. Numerous other European cities featured these types of races annually. And, believe it or not, in our country the United Parcel Service initiated its operation with a small fleet of bikes. Even the U.S. Postal Service brought cargobikes into operation. At that time, cargobikes and delivery bicycles plying the streets in many cities throughout the nation was a common sight. However, as the popularity of the automobile surged in the early 1900’s, the stunning creativity in cargobike design and use began to wane. 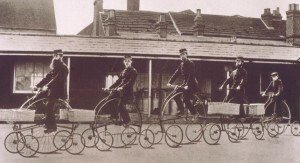 Some bike manufacturers made forays into car production by cannibalizing much of the cycling technology for the automobile – pneumatic tires, chains and spokes. Bicycles, once called scorchers because of the unparallelled freedom, utility and speed they provided, gave way to the promise of the unlimited mobility of the car. 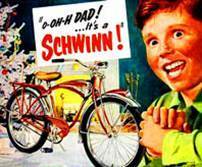 Thus ended the golden age of the bicycle and with it ushered in the perception of the bike as a toy for kids. This was especially true in North America. Fast forward to the early 1970’s with the OPEC crisis and gasoline shortages. The nation began looking over its shoulder at the bicycle again. Bike companies in the United States flirted with basic bikes for transportation and some cities and towns laid out a bit of bike infrastructure. However, the cargobike was barely visible except near the storefronts of pizza shops in cities like New York City and Chicago. Most of those bikes were made by Worksman Cycles. Founded in 1898, Worksman is the the oldest existing cargobike manufacturer in the United States and is still making industrial cargobikes to this day. Then, in the 1980’s, a huge bike revival occurred in the U.S. with the advent of mountain bikes and super-light road bikes. This return of the bike was skewed towards its “toyification” for adults and has ever since been vigorously promoted in this way by the bike industry and the vast majority of bike shops. While recreational biking can be a totally beautiful thing and there's no reason why bikes shouldn't be enjoyed this way, this movement produced a couple generations of performance minded enthusiasts who may ride feather-weight bicycles for 100 miles over mountains, but outside of that, the bike is barely an option as a vehicle for everyday transportation. Fat tire bikes are great, but lots of shops will carry expensive bike like these and not ones that are truly functional for our transportation. Biking soon became about performance with specialized clothing, expensive shoes, and high-tech headgear. This trend ran radically counter to the more advanced bike cultures in places like Denmark, Holland, Germany, Japan and China. The vastly contrasting takes on bike culture between the America and elsewhere is brilliantly illustrated in Ted White's insightful and artistic documentary, Return of the Scorcher, as he travels through China and parts of Europe and reflects on biking in the U.S..
What is clear is that for years the bike was viewed from a very limited perspective by the public as well as by government officials, planners, and bike shops. And more than that, the high-tech trends and lack of focus on functional riding turned away many folks in the United States who might otherwise have chosen to ride for transportation. And so, the powerful confluence of these unfortunate bike trends in the U.S. along with a hyper-motorized society that appears frozen in a 1950's version of the world, have had a profound synergistic influence on our thinking. This has thoroughly affected our mindset regarding planning issues and transportation, while placing deep limits on what we think a bike is and what it can do. Certainly there are many other factors at work here, but these two phenomena are largely responsible for setting us back from earnestly developing the bike as a vital and graceful piece of our transportation mix. Thankfully, a new bike movement is shifting cycling into a radically different gear and the cargobike is proving to be a rising star. While cargobike designs have primarily originated out of Europe for the past 100 years or so, the current cargobike movement is inspired by an American idea – the longtail bike. The original Xtracycle Free Radical attachment that can make almost any bike into a cargobike. In the early 1990’s, Jan VanderTuin, a human-powered vehicle engineer with an activist background and a co-founder of the community-supported agriculture concept, decided to set up shop in Eugene, OR. His idea was to start making the types of bikes he saw in Europe that could haul the groceries, large parcels or even beer kegs. Jan is sort of the godfather of the US cargobike movement and is still working and training folks to build and design for the future at his remarkable Center for Appropriate Transport. Then, growing out of this awareness that bikes can do more came the longtail cargobike in the mid-1990's. The longtail is basically a mountain bike with a stretched out rear for schlepping people and things. The original concept came from Ross Evans when he developed the Xtracycle Free Radical back in the early 1990’s in California. The Free Radical is an extension frame that will stretch almost any bike into a child carrying, stuff hauling cargobike. The best longtails now feature fully integrated frames (the three top companies are Yuba, Xtracycle, and Madsen) that can transport loads upwards of 400 pounds. They are packed with features like special kid’s seats, enormous panniers for carrying groceries, sidecar trailers, huge front baskets and an ability to tow another bike (great for bringing your kid’s bike along) and much more. They are elegant, fun, totally stable and kids love them. You will see them all over the VBike website. And there’s more! The development and popularity of the longtail has revived great designs from the past and birthed a whole new range of utility bike concepts. The Bullitt, a Danish redesign of the Long John cargobike, is fast becoming one of the most popular vehicles for families and businesses. And now there is an amazing selection of human/electric-power commercial vehicles designed to replace small trucks for delivery duties and others that provide passenger and taxi services. Putting a Charge in the Ride! The most exciting aspect of this revolution for us Vermonters dealing with mountains and distances is the electric-assist cargobike. 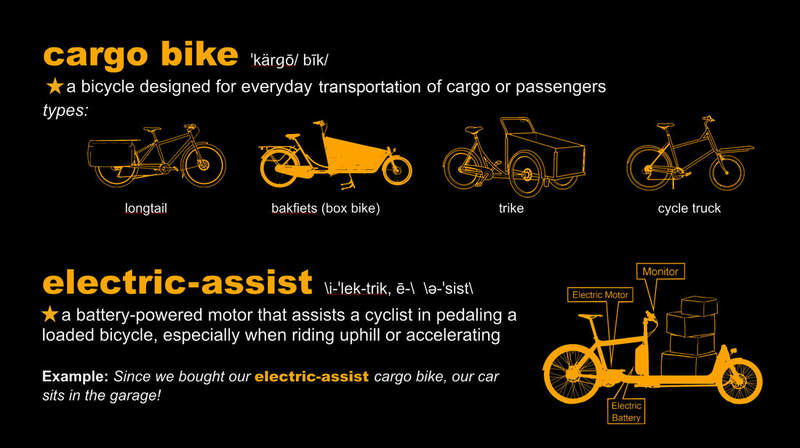 Electric-assist means that you have a motor that’s powering either your front wheel, rear wheel, or your chain drive. You are still pedaling and offering to your bike the purest, cleanest form of energy available – your body. However, you are also aided by a small, but powerful motor and battery that will help you up the hills with kids on board and with minimal sweat. 2 Yuba ElMundo e-cargobikes off to the Guilford Fair. With an e-assist cargobike there is far more control over the road and it turns out to be a great equalizer in car traffic, especially in places where you might feel there is not enough room or where you actually need to take the road. On local streets you can travel nearly at the speed of cars when you want to, making you far more visible to motorists because you are in their view for a longer period of time. On top of that, on those busy roads you will actually see fewer motorists passing you because you can pick up the pace, if needed. The typical early adopters of the e-cargobike tend to be parents yearning to bring their children into a more healthful relationship with the world and perhaps looking to set an example for how we can use our bodies to get around. And about those early adopters, it’s moms that seem to be leading the way! Firth & Wilson Transport Cycles in Philadelphia is one of those shops with a selection of cargobikes opening for business across the nation. Today, it seems like new cargobike designs are coming out virtually every other month and e-assist technologies keep on getting lighter and more efficient. And new bike shops catering to families and households are opening their doors across the nation. Most of these shops are carrying cargobikes and many of them are developing the expertise to retrofit any bike with an e-assist system. Meanwhile, Less Car More Go, a totally compelling cargobike documentary is in the making and everyday news articles seem to come out every aboutappear about families and businesses thriving with their cargobikes. There is something of a bicycle revolution going on! 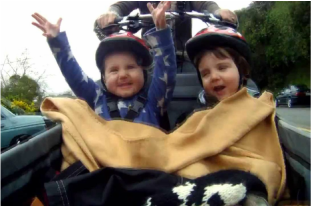 When you get down to it, most kids love riding on cargobikes and they often recognize how ridiculously sane and ecologically appropriate a cargobike is for local transportation and a world in need of real solutions. And that is what is just beginning to take root in Vermont, a place where we have a history deeply rooted in honoring the land and our bodies. Cargobikes and an integral part of the "Slow Transportation Movement" that will make Vermont feel, sound, smell, and look so much better. 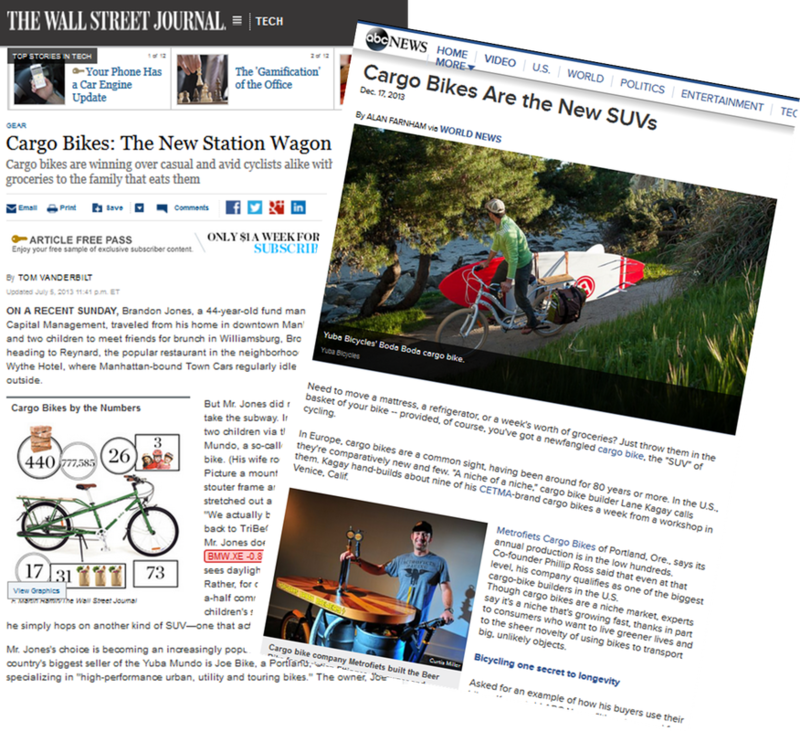 So, check out the variety of options on this website and see for yourself the innovation and creativity happening in the new bike cargobike revolution. We believe more folks on bike will translate into bringing us closer to some of the best notions of what it means to be living “in” Vermont. Of course we’re not talking about a transportation “silver bullet” here. This is about bringing a sense of balance and a human presence to our streets that is so often missing from car-centric communities. Come join a growing number of us in Vermont who are taking off on our cargobikes and inspiring our kids and our communities to know what it means to literally and figuratively think outside of the box. This is really so Vermont!